1. Heat 200ml whole milk and 3 thyme sprigs in a small pan until just before boiling; take off the heat and leave to infuse. Meanwhile, peel 750g floury potatoes and cut into chunks. Place in a large saucepan with 3 bay leaves and 2 garlic cloves; cover with cold water and a pinch of salt. Bring to the boil, then simmer for 15 minutes until the potatoes are tender. 2. Add 1 cauliflower, cut into florets, and simmer for another 10 minutes. Drain well and leave to steam dry for 2-3 minutes. Mash with the infused milk (discard the thyme and bay leaves) and 20g unsalted butter; season and set aside. Heat another 20g butter in a large frying pan until foaming. Add 200g kale and 8 salad onions, all roughly chopped, sautéing for 5 minutes, until soft. 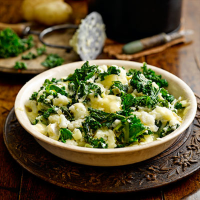 Fold the greens through the warm mash with 100g brie, thinly sliced, and 30g cheddar, grated. This recipe was first published in Tue Nov 17 16:09:00 GMT 2015.